Better by Marand is the developer of an iOS mobile application that complements clinical information systems by extending some of their functionalities to mobile devices. With its intuitive user interface, medical teams can quickly access relevant clinical data about their patients, whether they are at the bed side, consulting with other team members, or working from a remote location on the other side of the world. With Better by Marand's mobile application installed on her mobile device, Dr Kozjek, one of the doctors from the Institute of Oncology Ljubljana could be available for her medical team and patients in Ljubljana while also supporting the Slovenian team at the Winter Olympic Games in Korea in person. "Being able to access information and documents from mobile devices makes our professional and personal life much more convenient. Healthcare can benefit greatly from the concept of "mobile working". This is something that can increase medical team productivity, help improve patient outcomes, and contribute to savings in costs," says Anže Droljc, the Program manager for clinical applications at Better by Marand. 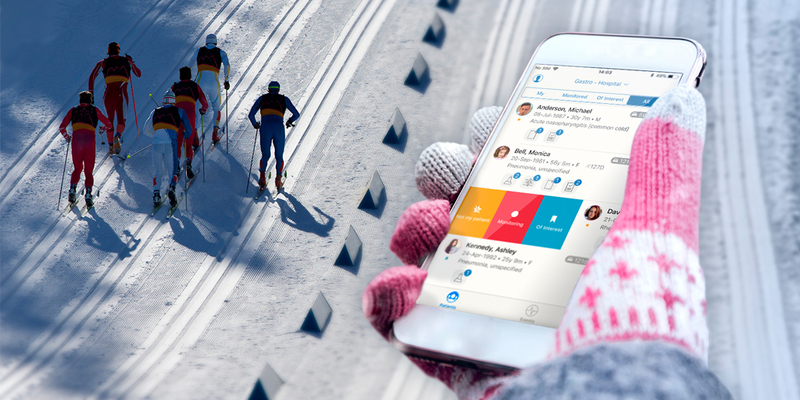 "The Slovenian doctor using Better mobile application at the Winter Olympic Games in South Korea is a perfect example of how mobile technology can enable medical team members to collaborate and take care of their patients - regardless of a doctor's actual location. The key is to develop intuitive and easy to use healthcare applications that support and inform the decisions of medical teams in what is undoubtedly a very dynamic and complex work environment." Healthcare IT applications should allow medical team members to spend more quality time with their patients. This means focusing on better understanding a patient's needs by presenting relevant information at any point of care; Better mobile application saves medical teams time and keeps them informed about a patient's latest conditions. It has a built-in patient summary view which provides visual information on conditions, allergies, lab results, documents, radiology results, and even other key information which may be stored in different systems - and it does all this on a single screen. It also enables the input of clinical notes, patient-related tasks, observations and diagnoses. Furthermore, this solution can be extended easily by building custom clinical forms - the functionality made possible by the app's underlying health data platform. Better by Marand's mobile application is already in use at the Institute of Oncology Ljubljana and University Children's Hospital Ljubljana, which is also the first hospital in the world to be awarded EMRAM Stage 6 certification by using a clinical system based on an open platform. The mobile application is based on the openEHR standard and is powered by the Better Platform™, which enables easy integration with local EHR/PAS systems. Relying on the powerful integration capabilities of Better Platform™ means that healthcare providers can follow a bi-modal approach to healthcare IT by setting up a vendor-neutral, standards-based health data platform, and this can serve as a basis for future innovation by establishing an ecosystem of innovative apps which can be developed by different vendors.